After a stunning racetrack debut complete with scantily clad, real life pinup girls, Speedycop and the Gang of Outlaws' airplane car made a respectable finish at this weekend's 24 Hours of Lemons race. We watched the Spirit of Lemons' build with anticipation, wondering how it would fare in an actual weekend-long schlep on a racetrack. It wasn't fast, but it didn't fall apart, and there's something to be said for that. Race organizers gave the Cessna-on-a-Toyota-van platform Lemons' coveted Index of Effluency award at the Carolina Motorsports Park Sunday, a classy honor doled out to the team which, against all odds, manages to get the least-likely-to-win heap to actually finish the race. No one was saying that an airplane fuselage cobbled onto a beat-up van chassis wouldn't win, but let's just say there were some doubts that it would hold together long enough to be a contender. It's terrible. It's a Lemons car. The rear suspension is chained down on both sides, so if you get above 5g on the turns, one of the wheels picks up off the ground. But it's great fun! But that's what Lemons is all about; bringing weird ideas to fruition and racing them to a glorious finish/miserable death on a track with a horde of other strange/ugly contraptions. A group of Russians calling themselves Team Sputnik (they gave me a rad Sputnik T-shirt) began their raceday tribulations hours before officials waved the introductory checkered flag. They had two wretched Nissans in the race, and one of the team's deranged members actually drove the one with no windows or heat to Kershaw, S.C. from Rockville, Md. at night. The mercury had dipped below freezing, but he stayed warm by donning a full suit of Russian furs. NSF Racing (I've been told that the NSF stands for "non sufficient funds") had entered a Lemons first; a Chrysler K-Car. It was a bold move, to be sure, and with a chained rear suspension and American flag livery, promised to be a gripping, if exceptionally slow addition to the race. But there was a reason for the K-Car's solo superlative. Despite the pristine grandma car condition the team got it in (the air conditioning even worked! ), NSF had to bow out of the race after only a few hours on the track the first day. The culprit was a gaping hole in the side of its engine block, caused by an errant connecting rod. 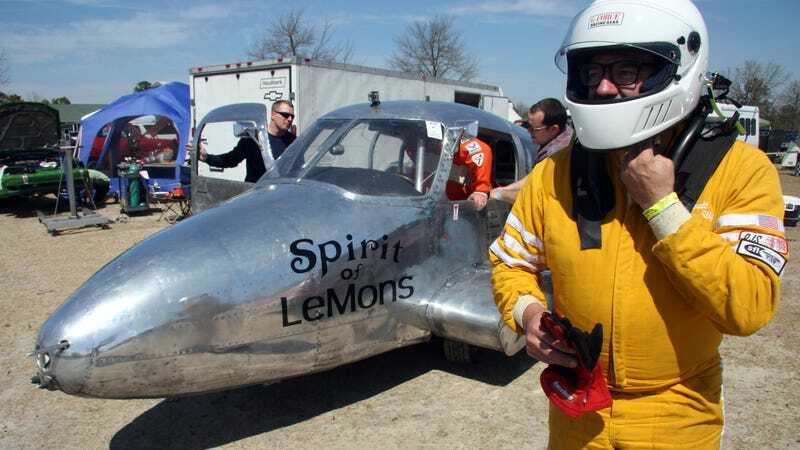 We hope to see more of the Spirit of Lemons. First off, what's not cool about an airplane car? It undoubtedly had the lowest drag coefficient of any car out there. Second, it seemed that Speedycop and his gang were being a little conservative during the shakedown cruise. I'm not saying I want to see the thing roll over, but it would be entertaining to see it pushed to or past its unknown mechanical limits.